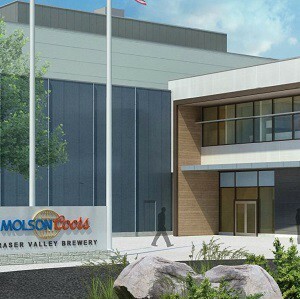 Molson Coors has started work in Chilliwack on a new $200-million brewery that is expected to pull workers from Vancouver and become one of the largest industrial users in the Fraser Valley city. In early 2016, Molson Coors closed a deal to sell its existing three-hectare brewery site near Burrard Bridge in Vancouver to mega developer Concord Pacific, marking the beginning of the end for one of the last large industrial businesses on the south side of False Creek. The site reportedly sold for $185 million and production has continued at the Vancouver brewery under a lease agreement. The new 400,000-square-foot brewery is a massive deal for Chilliwack, said Garth White, a principal with Avison Young. “This is hands down the largest (industrial) user that has ever located in Chilliwack, and probably will,” he said. White said the land remains in the province’s Agricultural Land Reserve, but is zoned to permit agricultural-related industrial use. “It’s pretty rare,” he said. The deal is a win for Molson Coors and Chilliwack, but puts further pressure on a constricted industrial land supply in the Fraser Valley, he said. Metro Vancouver’s current industrial vacancy rate is 1.9%, according to Avison Young’s most recent data. Other businesses have also moved east to escape even tougher industrial circumstances closer to Vancouver’s core, White said. Molson Coors, which had brewed beer for nearly 60 years in Vancouver, says the new Chilliwack brewery will play a critical role in its supply chain as the Western Canadian brewing and distribution centre for cider and beer, including its Canadian, Granville Island, Rickards and Coors Light labels. Chilliwack turned out to be the right place for a few reasons, said Josh Stewart, corporate affairs for Molson Coors, Western Canada. The brewery is expected to employ about 100 workers when production begins in late 2018 or early 2019. “Anybody that’s working in the brewery right now will have first dibs on any jobs that come open in Chilliwack,” Stewart said. The construction process will employ about 1,000. Stewart said Chilliwack’s City Council, Chamber of Commerce and Chilliwack Economic Partners Corporation all strived to make the deal happen. “We’ve had absolutely no problems with permitting and with land acquisition and working with them,” he said.